Concept drawing of new SET Building. Image courtesy of Edmonds Community College. From an Edmonds Community College press release. 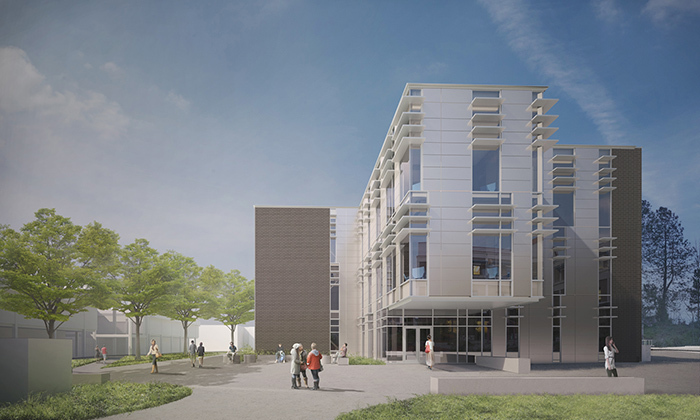 Edmonds Community College plans to meet the region’s increasing demand for employees who are trained in Science, Technology, Engineering, and Mathematics (STEM) with the addition of a new 70,000-square-foot building. “Edmonds CC plays a vital role in educating and training students for an increasing number of in-demand, high-wage STEM jobs,” said Dr. Amit Singh, Edmonds CC’s president. A public groundbreaking ceremony for the SET building will be held from 3:30 to 5:00 pm on Wednesday, September 12, 2018, in the west section of Parking Lot B. The building is scheduled to open in 2020. For more information and location, visit edcc.edu/SETBuilding. The Puget Sound Regional Council has projected the region to grow by about 1.8 million people between now and 2050, and about 1.2 million jobs will be created. Many will require workforce skills in STEM. “When our students have access to classes, tools, and equipment to help them develop STEM skills, we all benefit,” said city of Lynnwood Mayor Nicola Smith. Smith will be in attendance along with local legislators and members of the college’s Board of Trustees. A growing demand for STEM education has resulted in increased enrollment in Edmonds CC’s STEM courses. The SET building will accommodate the college’s need for more physics, chemistry, engineering, and math classrooms, as well as labs and offices. It will also be LEED Gold certified. The Washington State Legislature approved $47.1 million for construction of the SET building, which was one of 25 projects included in the Washington State Board for Community and Technical College’s $338 million budget request for the 2017-19 capital budget. Over the past 20 years, Edmonds CC has received numerous grants, totaling over $50 million, in support of STEM education from the National Science Foundation, U.S. Department of Labor, U.S. Department of Education, U.S. Department of Health and Human Services, and other public and private sources. For directions and a campus map, go to edcc.edu/campus.